WhatsApp is one of the best and popular messaging applications used across the world. Whether you want to chat with your friends, send them a photo, your location or set a photo status, WhatsApp is the app you love. Moreover, you can also make audio and video calls across the world for free. If you are a private person and don’t want anyone to peep in and snoop around your WhatsApp chats, then you must have locked your WhatsApp application with an app locker. What if you want to lock a particular group or a personal chat? Confused or should I say surprised to know that this could be done? Well, yeah this could be done! With Locker for WhatsApp for Android, you can easily keep your group and private WhatsApp chats secure and keep the intruders away by setting a pin. You can not only lock and secure chats but it also has the capability to secure entire app with a single pin. Decluttered Interface: The freeware app has a simple interface, intuitive design and therefore easy to use. Easy on Your Device: The app is lightweight, that’s why uses minimal resources and doesn’t hog the device space. Hide Personal Chats: You can keep your personal chat safe and away from nosey people. Minimum Permissions Required: App doesn’t need a lot of permissions to work on. Go to Google Play and Look for Locker for WhatsApp. Once installed on your Android, tap on the app icon to launch it. Now, create a four-digit pin and enter the pin again to confirm it. 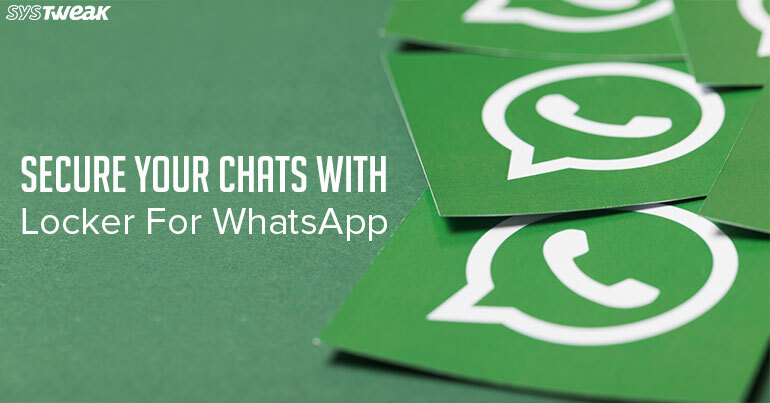 Note: The four-digit pin is common for WhatsApp app and the chats. The app will ask you to enter a recovery email address, in case you forget your pin. Once entered, the app will ask for accessibility permissions. To add chat that you need to lock, tap on the + icon. Note: Tap on the + icon and add a four-digit pin of your choice to secure your private chats. The app is distinctive and proves to be useful if you are concerned about the security and privacy of your WhatsApp chat. Lock your WhatsApp chats with the app and forget about the worries if your Android is accessed by others. Try the app and let us know what do you think of it in the comments below.